In the game eight days ago, center Kyle Tresnak was effective early and that led to an early lead for Weber State. Then he got into foul trouble. As soon as he went out of the game, the tides shifted toward Montana. I asked Damian Lillard yesterday what the Wildcats needed to do against the zone that we all know they are going to see again tonight. He told me they need to get the ball inside it instead of settling for outside jumpers. Key #2: Stay out of foul trouble. This seems like a no-brainer in every game, but that is especially true tonight. Weber State needs everyone in this one if they are going to win it. It’ll also be key because just about every borderline call will be going Montana’s way tonight in the raucous home court advantage that is Dahlberg Arena. Key #3: Lillard needs to step up. The cloud hovering over Damian Lillard’s head his whole career is his perceived inability to show up for big games. Tonight will be the biggest chance he will have had in his career. If he doesn’t come to play tonight on a nationally televised game in the tournament title game, the Wildcats will go home runners up again and it will forever leave his Weber State career tarnished. We’re heading over to Montana’s Campus to ask them about tonight’s game. Look for our pre-game video package in a few hours. Portland State leads Weber State, 35-30, at halftime. Right now, it’s clear that both these teams know each other well. Each team knows the others’ offensive schemes very well. The reason both teams are scoring at all is because neither of them can miss from deep. Portland State is getting to the basket too easily right now. Part of that can be attributed to Charles Odum’s quickness. He has beaten his defender off the dribble at times which have led to the help defense collapsing on him and finding the crashing open man. I would expect that adjustment to get made at halftime for Weber State. It will be hard for Portland State to both get to the rim this easily AND shoot this well for the rest of the game. If they do Weber State will need to also shoot lights out. One or the other will likely get stopped in the second half by the Wildcats. Gelaun Wheelwright and Damian Lillard both have 9 points to lead Weber State. Odum leads all scorers with 16. If Weber State is going to win this game, Scott Bamforth is going to have to get his own shots. Right now, he can’t get himself open. He’s 1-of-2 from the field with ZERO 3-pt attempts. Weber State and Portland State are the two highest scoring teams in the Big Sky Conference. Part of the reason for that is that the two teams have the two highest scorers in the league. The Wildcats have the conference’s second leading scorer and the second leading scorer in the nation in junior guard Damian Lillard (24.5). The Vikings have the Big Sky’s second leading scorer in senior guard Charles Odum (19.0). Should lead to a high-scoring affair. Expect this one to be in the high 70’s/low 80’s. Tapscott is the Vikings’ second leading scorer, but Weber State fans know him as the guy who made first team all-Big Sky instead of Scott Bamforth. Odum is going to get his points, but if Weber State can hold Tapscott down, they should be able to win. If Portland State is going to pull the upset, it will be because Tapscott contributes heavily. Get back on track from three. Weber State is one of the best 3-point shooting teams in the nation, but they dropped into second place in the Big Sky after going 3 of 26 from behind the arc against Montana last week. If the Wildcats can get back up to their normal 40-percent from 3-point range, the Vikings will not win tonight. Get off to a quick start/weather the early storm. The Wildcats have not played in seven days. Portland State played Saturday night. That means the Vikings will be in rhythm and the Wildcats may be out of sync early. Expect to see Portland State get off to a quick start in this game. 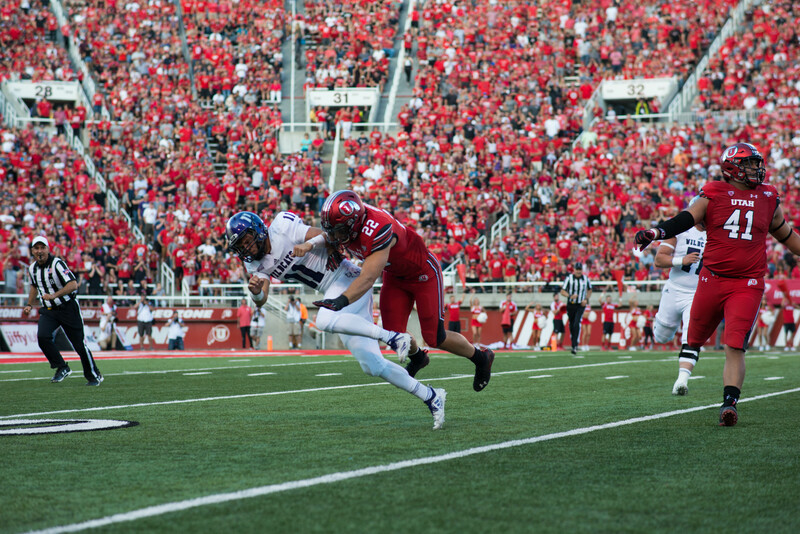 If Weber State can limit that early run or get off to a quick start themselves, they will win tonight. 27 minuets to game time! The arena is slightly bare but the team is pumped and ready to dominate. We are just three hours away from tip off here in Missoula and Wildcat players are feeling good about tonight’s game against Portland State. I have run into a few of them here at the hotels and they are loose and ready to go. One of my biggest fears going into this tournament was the look-ahead factor. Will the Wildcats be looking over Portland State for a potential behemoth rematch with Montana? I was very worried about this going into the tournament—key word: was. The players and staff I’ve talked to here today know that Portland State is playing great basketball right now. Having won seven out of eight, the Vikings are playing as well as anyone in the Big Sky Conference. 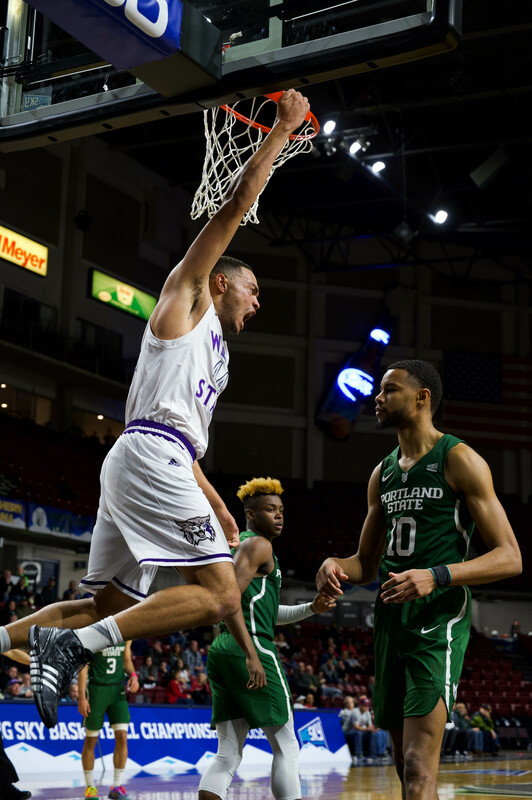 Weber State took care of business against Portland State both times they played during the regular season, winning 92-79 and 88-81, but the players and coaches are definitely NOT thinking ahead to a possible rematch. Good news for Wildcat fans. Should be a shootout tonight. We just visited Montana’s arena about an hour ago. Parking looks limited so if you are traveling to the game arrive early. The team started their shootaround at 10am. The staff as arrived in Missoula Montana. It is lightly raining and the temperature is 36 degrees. We arrived just as the WSU team and staff were heading to their rooms. The halls of the hotel are covered in Montana University photos, many of them from the early 70’s and 80’s. Stay tuned for more info and updates about the big game! Members of the Signpost and Weber State News are on the road heading towards Missoula Montana for the Big Sky Championship. We are currently in Idaho Falls ID at Famous Dave’s. Watch Sports editor Nathan Davis eat Famous Dave’s hottest hot sauce. What would a road trip be without junk food?